THE TULLAMORE NATIVE who won $21.5m in the New York State Lottery has revealed she only bought her ticket for the draw after the poor weather forced her to cancel her trip home. Trisha Eisel, 40, a mother-of-three living in Long Beach, bought her ticket for the draw over the Christmas holiday – when she had planned to return to Co Offaly, only for Ireland’s winter snow to leave her flight cancelled. “I should have been in Ireland, but if I had gotten out, I wouldn’t have bought the ticket, I would have been at home,” Trisha told today’s Irish Daily Star. Her $8 ticket had been paid for by a previous $7 winning, added to a $1 tip she picked up at work in the Saloon Bar in Long Beach. The Star adds that the winning draw took place on January 5, but that Eisel had waited for two weeks to decide whether she would redeem her entire winnings at once – a move that would see the payout almost halved – or have it paid in instalments. Last week, she decided to redeem the total $11.9m one-off payout, which itself is reduced to $7.9m (€5.7m) after tax. Eisel returned home to celebrate the jackpot with her family last night, who she has visited every Christmas since she left Ireland in 1995. Neighbours said the surprise windfall was unlikely to change her family’s lifestyle, and that she would spend the winnings on a house in New York, with a big yard for her three sons and a new dog. The Irish Examiner adds that she hopes to give up her job. 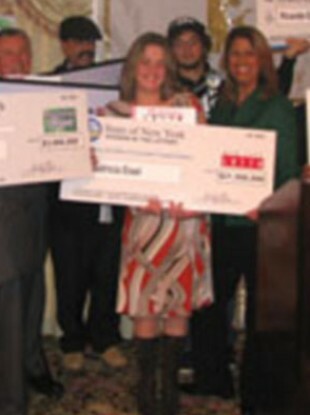 Email “$21m NY lottery's Irish winner won after snow delays”. Feedback on “$21m NY lottery's Irish winner won after snow delays”.